I am now at the end of the second week ‘loosely’ following the main principles of The Viva Mayr Diet and things are still looking good. I say loosely as I am really not very good at totally following any hard and fast rules! However my waist has reappeared as if by magic, which has led to my clothes feeling far more comfortable and the numbers on the scales are still moving in the right direction (I have lost just under 2kgs) so I am very happy. In the first week (see here for my report) I struggled to drink enough water and herbal teas between my meals, as liquids with food dilute the digestive process so are a no no for Viva Mayr, but this week that has been a little easier. It is just a matter of adjusting my routine, which I’m sure in time will become more normal. Chewing, and by this I mean really chewing each mouthful is already becoming more routine and has led to some odd discoveries. A small handful of crisps with a homemade wrap for lunch when chewed correctly were absolutely disgusting and the salt burnt my mouth. I can’t see myself ever wanting to put another crisp in my mouth again, so that should save me quite a few calories over the years. You really do get enhanced flavours from your foods when you chew, it really does fill you up and it is better for your digestion too. I still haven’t felt hungry between meals, which (unfortunately for Ade and Ed) has meant I haven’t baked a cake since returning from the UK – shock, there is usually always cake in the kitchen. I do feel a little guilty and I will get my baking mojo back I’m sure, however at the moment I’m enjoying a delicious walnut yoghurt cream dessert (inspired by one of the recipes in the Viva Mayr book) where I would usually have eaten cake. I am also not yet ready to put temptation under my nose, especially as a packet of Cadbury Mini Eggs nearly ruined everything over Easter. 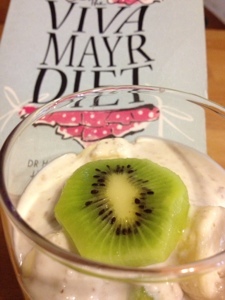 As it is so delicious I thought I would share my walnut yoghurt cream recipe with you. Take two handfuls of shelled walnuts and blend in a food processor until quite fine. Add a tablespoon of cold pressed walnut oil and two tablespoons of water and blend again. This will give you a lovely wet walnut paste that I mix with five tablespoons of homemade live natural yoghurt. The result is delicious and very healthy, walnuts are a super food, Viva Mayr sings the praises of using cold pressed oils and natural live yoghurt is also very good for your insides. For breakfast I pour some over a sliced banana and for lunch I add it to a mixed fresh fruit salad. I could easily become addicted as it is delicious on it’s own too.